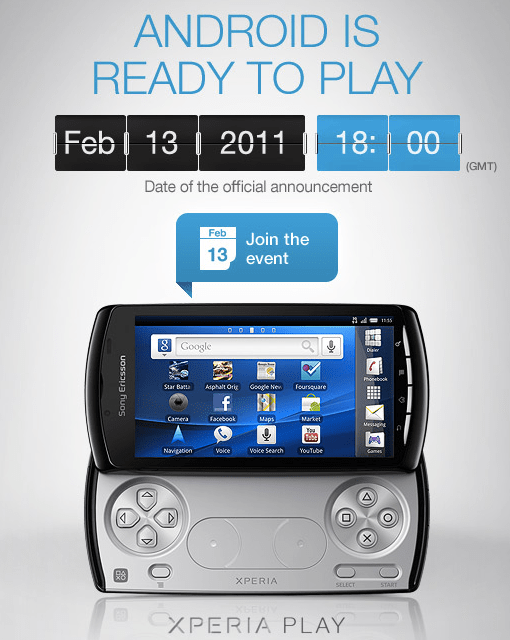 After the long wait, Sony has finally acknowledged the existence of the Xperia Play AKA PlayStation Phone (or PSP Phone) with the slogan “Android is ready to play.” A fitting mantra if I ever heard one. Still, official technical details are still kept mum until Mobile World Congress event on February 13 so this is more than just a paper announcement (lol, not even a paper launch?). What makes the launch of the Xperia Play exciting isn’t the phone itself but rather, a new service that Sony is prepping up to fill the Android marketplace with PlayStation games. Via a dedicated service called the PlayStation Suite, users can buy and play (at first PlayStation 1 games, but soon after PSP games as well) games on their favorite Android device. Qualcomm Adreno 205 GPU, along with what’s likely to be a 1GHz Snapdragon QSD8255. It sports a 1,500mAh battery, the 854 x 480 resolution on a 4-inch LCD, a 5 megapixel autofocus camera with LED flash, 512MB RAM, 512MB ROM, a microSD slot, SIM slot, micro-USB, and a second mic on the back for active noise cancellation (as found in the Nexus One).